The Jade Buddha returned to Charlotte this past weekend. I saw it last when it passed through here on the same date in 2010. Not much that I can add to the traditional history of the statue itself. Best if I leave it to what I wrote 5 years ago. If this exhibit comes through your area, take the time to go and see it; if only to observe the people who are adherents to Buddha. They come in all shades and sizes. Shapes; too. The Jade Buddha is in Charlotte for the next week. It arrived here last week and is on display at Lien Hoa Temple on Lake Drive. The statue is only 10 feet tall but seems much larger. Made from 4 tons of jewelry grade Jade and adorned with a halo of gold gilt, the statue beams benevolently over all who come to view it. The four-ton "Jade Buddha for Universal Peace" was being exhibited around the world on the way to its permanent home at the Great Stupa of Universal Compassion in Bendigo, Australia. The Buddha is worth about $5 million. (Smaller, lighter ones for wearing are on sale for about $15 dollars.) The statue was carved from an 18 ton block of jade found in Canada called the Polar Pride", which was found in 2000. The boulder was sent to Thailand for carving and is fashioned after the Buddha statue which sits in the Mahabodhi Stupa in India. The statue has also previously been displayed in Vietnam and Australia. The sight of so many Buddhists devotees, as well as the smell of the food, both work together to put a smile on the faces of all who come to view it. And that's exactly the point of the tour. Charlotte has quite an active Buddhist Community. Last year Sue and I went to see the Essences of the Dalai Lamas. That exhibit consisted of the remnants of the cremated remains of the past Dalai Lamas. When the body is cremated a small portion of bone, or metal and minerals, are left behind and these are called the "Essence" of the deceased. In the case of Dalai Lamas the remnants are considered sacred relics which contain wisdom. They are almost like jewels. 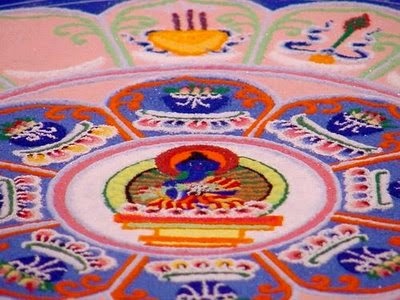 Another Buddhist event worth catching is the sand painting ritual. This tradition consists of groups of Buddhist Monks working in teams to create an intricate work of art. The colored sand is painstakingly applied through brass cones that are manipulated with a metal rod to allow the exact placement of each grain of sand in a pre-ordained traditional image. Upon completion this work is carried lovingly to the nearest body of water and thrown in, thus symbolizing the impermanence of all things. Events like these serve to hammer home the reality that we all must share this one small planet. And when you look around at the different faces and explore the different cultures you are helping to achieve that goal.